Once upon a time, I promised to “orient dreamers and dream tenders alike to some of the ‘Starting Places and Radical Givens’ of Dream-Centered Living.” No sooner did I make this promise than all sorts of utterly unexpected events occurred, keeping me from my original intention. You may recall that the inscription over the third door of Apollo’s temple reads, “Make a vow and mischief is nigh.” Mischief, indeed! Now, it seems, may be an ideal time to continue with the series of Starting Places and Radical Givens—without making any promises! As mentioned in Be Vigilant While Sleeping, one of the tasks of spiritual-soul dream tending is to track the activity of dreams. In other words, in addition to noticing and tracking the light of dreams and the various ways that we are touched into being by this light while dreaming, we also want to have a sideways eye out for what the dream is doing. Generally, the activity of dreaming is one of those hidden-in-plain-view aspects that somehow remains mysteriously hidden from the dreamer until his or her attention can be brought to round to question what the dream is actually doing. Other hidden aspects meanwhile include: Who is dreaming? Where is dreaming happening? And, From where does the light of dreams emanate? Yet we are so accustomed to focusing on the content of dreams that when asked about any of these more hidden aspects of dreaming, that is, of dreaming per se, folks generally have a hard time grasping what’s even being asked. In time, however, with patience and practice, dreamers can be released from the spell of the dream contents and brought into noticing these mysteriously hidden-in-plain-view, phenomenal aspects of dreaming, including the activity of dreams. It may be helpful to begin by making a distinction between the action of dreams, on the one hand, and the activity of dreaming, on the other. While they are related, they are not identical. The action of dreams refers to whatever is happening in the dream, content-wise, in other words, the action of the dream contents unfolding, whereas the activity of dreaming has more to do with what’s happening through the dream and therefore has everything to do with the presences working behind the scenes to affect the dreamer through the action of dream’s contents. The dream opens and I am sitting in the passenger seat of a truck with a female dream-friend behind the wheel. We drive into a meadow at the top of a mountain whereupon we find a gruesome scene. Two men are slaughtering suckling pigs. One of the pigs is splayed out, and, though a suckling, is the same size of the man wielding the knife. As the man plunges his knife into the pig’s throat and slashes it all the way down, pig blood and guts tumble from the pig’s body. In an instant, the other pig, the knife-wielding man, and I make an agreement, which is “directly” conveyed between us (without speaking). The agreement has to do with the second suckling pig, who has turned to me for help and sanctuary. In the shortest imaginable passage of time, it is agreed between us that the second suckling pig will be spared the fate of the first suckling pig, and that it will go from this meadow now with me and my friend. Instantly, the little pig bounds over to the truck. I open the passenger door and let the little pig inside, noticing that it has only a couple of scratches on its head, but is otherwise fine. Once inside the truck, the pig looks up at me with whole-body gratitude. 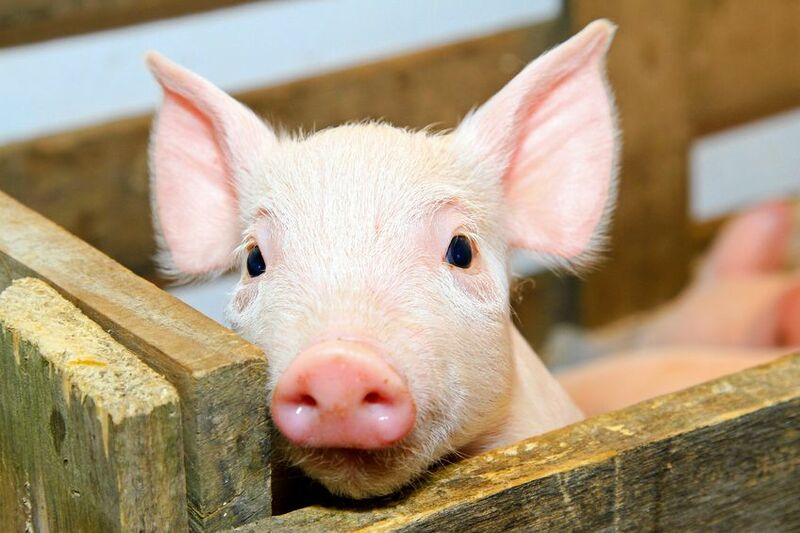 As I look into his little pig eyes, and take in his gratitude, I am utterly overcome with emotion: how did this little creature know that he could trust me? The dream ends as I wake up. The “lit up” action of the dream involves driving a truck into a meadow with a dream-friend and finding a gruesome scene, an agreement, rescuing a suckling pig from certain slaughter, receiving the pig’s gratitude and, finally, being overcome with gratitude for the little pig’s trust. But what is this little pig dream doing? It’s revealing, to the dreamer herself, the depth of her desire and longing to be found trustworthy. This is revealed to Georgie through the “lit-up” image of the grateful sucking pig, but that it has absolutely nothing, in fact, to do with rescuing suckling pigs or any literal sort of thing like this, or, worse yet, what “pig” means or any of that nonsense. As a general rule, the biggest clue with regard to what any dream is doing comes during liminal space–in the threshold between sleeping and fully waking. By paying particularly close and careful attention to what is experienced bodily as the dreamer’s living, dreaming body returns to the dreamer’s physical, in-the-bed, waking-up body—when the dreaming body and the physical body are reunited, as it were–dreamers can begin to get a much clearer sense of the presences of the dreamtime, those presences that, in a very real sense, are behind dreams or waiting “in the wings.” And dreamers can also begin to get a feel for just what these behind the scenes Dreamtime presences are endeavoring via the contents of dreams. Bear in mind that even when the dreamer has a strong sense of what the dream is doing, the dream activity is never fully complete because what the dream is doing is always on-going. In other words, it’s still happening. Or to put it another way, the depth of Georgie’s longing to be found trustworthy is still being revealed to her, years after she was given the initial dream revelation. Because the very nature of dreams is revelatory, sometimes dreamers may be “brought to their knees” by the immediacy of the activity of the Dreamtime presences and by what’s being revealed. When dreamers experience the bring-you-to-your-knees variety of dreams, it’s helpful to remember that dreams are always trying to love us forward. So we get the dreams that undo us when we’re robust enough to be undone, whereas we get the “blessing” variety of dreams—those that bestow a kind of “kiss of life” on us–when we’re in danger of losing sight of the project that we agreed to come here to remember and display altogether. Mostly our knowing “about things” with regard to Dream-Centered Living gets in the way of discovering whatever it is were endeavoring to engage with in ongoing ways, but knowing that we’re given dreams that undo us when we’re strong enough to be undone is one of the things that I do actually want to invite dreamers to know, to remember, and to trust, because it almost NEVER feels this way to the dreamer upon waking. If you have questions regarding the differences between the action of dreams and the activity of dreaming, please feel free to contact me. I’d love to hear from you and I welcome your questions and comments. And with any amount of grace, I’ll endeavor to send out more in this series of Starting Places and Radical Givens of Dream-Centered Living in the weeks to come. This is all so beautifully put; you’ve laid it all down here in the most gorgeous way. Dreaming and working with dreams can become so confusing sometimes; It may have to do with that “nonsense” tradition of doing a sort of facile triage with dreams and assigning each element of a dream an indelible meaning, as if you’re running the dream through Google translate. As you’ve made very clear here, that sort of thing really diminishes and limits the dynamism of dreamers and dreaming. Thanks for the kind words, Jay! Running dreams through Google translate–haha! Yes, that’s exactly what it’s like. Well put! Beautifully written, highlighted and engaged with … Thank you for posting! You’re most welcome, Jacque! Thanks for reading. I was bummed at lil pigs fate…. Thank you for the information, processing what you shared though. I remember your assurance when I got the dream of my fallen car in the parking structure and seeking help from my brother. I remember your reassurance that I was strong and ready. And to this day 4 months later I still find strength in the process. You were strong and ready then, Maureen, and you still are. Thanks for being such a stalwart and generously-spirited supporter of Dream-Centered Living. Third from the last paragraph went right there…Being loved forward by your own spirit soul sub-conscience in the light of the light sounds like a perfect dream. Being robust enough to be or come undone when the dream provides the opportunity would be truly be enlightening. Let me love myself through all that needs to be revealed to me by me. Thank you for inspiring my best friend to be the best he can be. He is a daily marvel and such an a role model thanks to you. It’s like watching the driest succulent produce the most amazing and beautiful flower everyday. Thanks for the kind words, Suzanne. And it’s all thanks to your introduction, my friend. And our friend is indeed the “most amazing and beautiful flower”–truly something to behold! I’d be lying if I said I wasn’t proud of him. I’m so grateful to you for introducing us. What a joy it’s been companioning this beautiful project!